• Is the capital gains tax rate really 15%? "The Policy Of The American Government Is To Leave Their People Free, Neither Restraining Them Nor Aiding Them In Their Pursuits." Mao Zedong said, "Political power grows out of the barrel of a gun." Mao, although a tyrant, was at least honest regarding the subject: he admitted to the use of force when his subjects didn't cooperate and obey. If coercion wasn't used, Mao's laws were meaningless. Of course, not all laws are imposed by dictate. Many (if not most) in "democratic" societies are imposed by an elected body or majority, but this doesn't make them any better, proper or efficient. Most fall short in accomplishing their advertised goals and create unintended consequences, which must be "fixed" by creating yet more laws. Some laws created by elected bodies are even draconian, as is FATCA (the Foreign Account Tax Compliance Act, the subject of issue # 49 of Wealth Creation Strategies). Libertarians seek to eliminate political power by restricting to a bare minimum the laws governing individuals' actions and rights; they see laws that go beyond protection of life and property as essentially corrupt and immoral, because they require the initiation of force. The Founders of this most exceptional nation created a document that severely limited political power and, therefore, the initiation of coercion. They did so because they knew that no one can be trusted with such power. As Richard J. Maybury puts it, the enemy of freedom isn't Democrats, Republicans, liberals, moderates or conservatives; it's political power. Unfortunately for those who believe in individual freedom and responsibility, the document our Founders created has been distorted beyond recognition. Those favoring political power-power over others-have done tremendous damage: from ruling that the state has the power to abridge contracts in everything from two adults agreeing to a wage or a price for renting a home; to ruling that "penalties" are in fact "taxes" even though they are penalties, and that Congress can do anything it pleases under the guise of its taxing power. The fundamental question libertarians ask is: why should anyone else have the power to control you, your life and the derivatives of your life outside of ensuring you are not harming others? They also ask: by which method would you prefer to decide things—guns and jail-time, or voluntary trade? They point out your choices are coercion, voluntary agreement, or a combination of the two. Pure statists choose coercion; libertarians choose voluntarism at every opportunity. Credo # 1: It would be arrogant to suggest I know better how to live your life and spend your money than you do. Credo # 2: My needs and desires, however great or intense, do not bestow upon me the right to take what is yours, including your life and the derivatives of your life-your ideas and tangible property. To suggest otherwise creates a relationship not dissimilar to that of master and slave. Credo # 3: It is immoral to fail to keep my contractual promises. These three ideas form the foundation of our nation. Our individual freedoms make our nation the greatest and most exceptional ever. Since its founding, politicians (by pandering) have sought to erode the freedom these ideas guarantee. This has occurred in the name of "justice," "social justice," "equality," "help the poor," "help business," "help the farmers," "protect the consumer," "spread the wealth," "protect the environment," protect or help this or that constituency. The problem is there is no government intervention that doesn't violate one or more of the three credos and, therefore, violate the rights of others, regardless of the chosen excuse or rationale. Everything libertarians believe and, to the extent humanly possible, all they do follows these three principles. These credos allow voluntary interaction between individuals; they do not allow coercion. Libertarians vote as consistently as possible using these principles as their guide, severely limited though they are in choices compared with the plethora of options available when government doesn't interfere, or interferes less (think: presidential candidates vs., for example, the choices in a supermarket, a car lot or a computer store). They often vote for a Libertarian Party candidate, hoping to influence the two major parties' platforms; I voted for the Libertarian Party candidate in every presidential election until this one (and in every election until 2010). Libertarians sometimes vote for whatever they think is the lesser of the evils, meaning the candidate who they think will do the least harm to these credos. Mr. President, I didn't vote for you but I know libertarians who did. You have gravely disappointed them. You failed to keep the few libertarian-leaning promises you made. One was openness in the legislative process, which you have repeatedly violated, especially when passing your health bill. Another was a promise to decrease the power of lobbyists, which you clearly have failed to do. A third was to post all bills on the White House web site for at least five days prior to signing them. Before your election you stated, "When there is a bill that ends up on my desk as president, you will have five days to look online and find out what's in it before I sign it." You haven't done this. Yet another was to ease immigration, but for whom? You nearly tripled immigration audits of employers, and rather than allowing tech-oriented students and workers to more easily immigrate legally you made it much more difficult and instead pandered to those aliens who are already here illegally-and you did this by deciding that because you didn't like a particular law, you wouldn't enforce it. And you failed miserably in keeping your promise to become the "post-partisan" President. If we are to vote for increased coercion, you could at least do so in a bipartisan way. Instead you have divided the nation by ramming down our throats a purported health bill that consists of some 2,400 pages of rules, most of which you and your comrades never even read (and in a completely opaque process). Incredibly, you claimed this was a mandate because you did so with a filibuster-proof 60-Senator majority, even though three of the Senators won election by a hair (and in hotly contested elections, one of which reeked of fraud and another of which required lies about the incumbent that cost him the election) and even though the bill barely squeaked by in the House (219-212), and even then requiring all manner of political payoffs to "friends." The bill passed both chambers by a 100% partisan vote, in which it was argued it's a penalty and not a tax so the bill wouldn't have to be sent back to the House, which is where according to the constitution all tax bills are supposed to originate. Then you warned the Supreme Court that if they failed to judge this massive intrusion into our lives as constitutional there would be hell to pay, as if their job isn't to rule at least a few of your infringements on personal liberty unconstitutional. Then they ruled it constitutional on the grounds that, even though everyone who supported it agreed it was a penalty, it's really a tax. Now all Congress has to do to tell us how to live our lives and have it ruled constitutional is to call something a tax. You have helped set the stage for a potentially greater loss of liberty than imaginable just a few short years ago. Since such rules are inherently coercive, libertarians cannot support them, however well-intentioned they may be. But intentions are meaningless when creating something that at its best mimics a Soviet bureaucracy. The 150+ agencies and bureaucracies created by your bill would make a Soviet central planner proud, because it greatly diminishes or eliminates the rights of individuals to voluntarily contract with medical providers on nearly every conceivable level. A government can't even make a pencil (see the brilliant essay I, Pencil at http://www.fee.org/library/books/i-pencil/); how could one deliver health care in a rational and caring manner, at affordable prices and with improvements in quality over time? You and I know it can't, at least without severe rationing as in so many other countries; it's just another way to control people. And credo # 1 suggests such rules are just plain arrogant. Your government, and those that came before you-both Republican and Democrat-created policies over many decades enforced by laws that resulted in massive cost increases in medical care far beyond what would have occurred in a free market, the most egregious of which was Medicare ($9 billion in expected inflation-adjusted expenditures predicted for 1990 back in 1965 ended up being $90 billion). You took advantage of this when you found many voters clamoring for a government "solution" to the increasing costs of medical care. What you did is not dissimilar to a podiatrist shooting you in the foot from behind a screen where he can't be seen, only to have him later offer to operate on your foot. The Act bearing your name has, in fact, created a horrifying new precedence in creating an entirely new tax, the 3.8% tax on investment, rental and wage income on those with over $200,000 of income ($250,000 for married filers), which is unadjusted for inflation. To enforce this and the rest of your mandate, an estimated 16,000 new IRS agents will be hired. Anyone with a whit of insight into incentives knows that government revenue from this new tax will fall far beneath expectations; those thresholds will not only have to be ratcheted down, but the tax rate will eventually increase. Your Act did nothing to improve incentives to conserve scare resources by encouraging consumers to shop more carefully for health care and, in fact, worsened them on every level (why shop carefully or be picky if it isn't your money?). The American people—especially the nearly-half that pays no income tax—may opt for still-higher taxes on those few who continue to pay rather than suffer with the otherwise inevitable price caps and resulting rationing of medical care typical of the U.K., Canada and other countries, which have suffered similar government takeovers of health care. If you wonder about the lack of new investment and jobs, the number of which has declined by roughly 4 million since you took your oath of office and which, if we had gone on the trajectory of a Ronald Reagan recovery after he took office in 1980 would have increased by at least several million by now, you have only to look to your own policies, including this top-down micromanaging of our lives. You've scared entrepreneurs, and scared people don't create wealth and jobs. In fact, you have hammered those who create wealth and jobs—wealthy business people—by accusing them of being "greedy;" yet greed is a natural human condition. As journalist John Stossel asks, have you ever turned down a raise? Everyone is "greedy," Mr. President. It's a question of channeling it, and greed is properly channeled only in a free market economy. As Stossel puts it, free markets restrain greed—if you want to make money in the long run you must please consumer-kings by giving them what they want. This pursuit of self-interest is channeled improperly in statist economies, whether socialist, fascist or crony capitalistic, where often the worst people get to the top—and stay there. Those who please consumers in the marketplace reap gains, while those who don't because they screw the consumer should go to jail, and do so when government does its job—and if government didn't have its tentacles into so many other parts of our lives, it might better do its job. Under statism those who gain political power, regardless of the quality or price of the product produced, profit. By your actions (and those of your predecessor) in bailing out crony capitalists from their own folly, you have shown you support the latter. Where markets have problems, they quickly self-correct and do so for the very reason that you decry: the pursuit of self-interest. You maligned the creators of wealth in your "You didn't build that!" speech, but not only because of what most commentators noted—that many great builders have achieved great accomplishments on their own. To the extent you are right-people build things all the time with the help of others—the examples you gave are government workers and systems-government teachers, government infrastructure and the like (and please don't tell us government was responsible for building or commercializing the Internet—it was invented by Xerox, and a 1982 handbook on computing warned students that it was "illegal to use [internet predecessor] ARPAnet for anything...[other than] government business," and it remained "highly controversial" when the Internet was allowed to go commercial). You left out the computer magicians, the scientists, the Henry Ford's who came before us and invented new production techniques, the Steve Jobs's who reinvented communications and the dissemination of music—the geniuses on whose shoulders builders have stood. Of course builders don't (usually) build it all by themselves, whatever "it" is, as Sir Isaac Newton put it, builders and creators stand on the shoulders of giants. 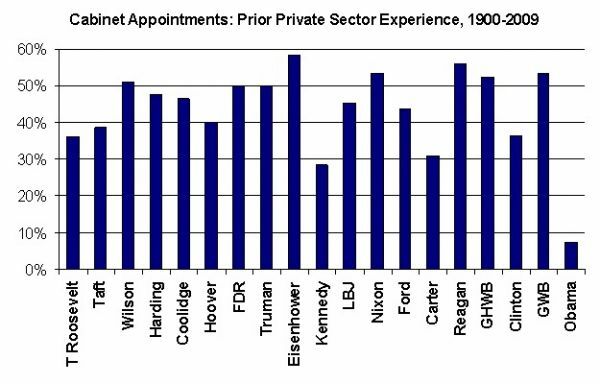 But the vast majority of those giants stand on the shoulders of non-government institutions and creative private individuals. Your comment, however, provided insight into how you think: "Government, making you do something, is the solution." Libertarians think, "People cooperating voluntarily to create something is the solution; government is the problem when it stands in your way." Aside from playing your usual "blame game," you further demonized such creators by explaining to reporters the reason companies aren't hiring isn't because of your policies, but because the economy is so automated, as in "Look at all the jobs lost because of technology like ATMs!" This is Luddite thinking at its finest. Two of your own economists tried to talk some sense into you, arguing that in the long run machines create more jobs and revenue, albeit oftentimes in different fields by freeing up resources, and in the long run, improving the lives of us all. According to reports you roundly rebuffed the idea that Joseph Schumpeter's "creative destruction," the process of continuous reinventing with older processes like travel agents being largely eliminated, is a good thing for society and economic growth (even if temporarily challenging for those whose job are replaced). It's so simple: if technology costs jobs, we should go back to the stone-age. It's incredible that the idea, if it was simply presented as in, "If you are right, the day of horseless carriages would have ushered in an era of pervasive and permanent unemployment," didn't get through to you. You have slandered wealth creators, while all you have done is shift wealth and borrow from future wealth creators. You've shifted and borrowed far more of other people's wealth than any American politician before you. Astonishingly, as recently as 2006 you voted against raising the debt ceiling by a now seemingly-mere $800 billion, objecting, "Raising America's debt limit is a sign of leadership failure." Yet, in just four years under your administration national debt has increased from $9 trillion to nearly $16 trillion and you have taken another $8 trillion or so of people's hard-earned money, to squander and largely give to those who didn't earn it. Yes, this spending-spree is not all your fault (this time, you're partly right); it's the fault of a belief we have the right to live off of others and a system that allows and even encourages it. However, you have expanded this ideology and scope of this in practice to a degree heretofore unimaginable in the United States. We are living off the inheritance of our children and grand-children. We're consuming what we haven't created or earned and expect someone else to pay for it, including the un-born, which strikes me as incredibly, unfathomably immoral. And it's unhealthy, not only for economic growth, but also for the personal growth of the individual recipient of such largesse—who is thereby discouraged from ever becoming all he or she can become via success in the marketplace by providing others with goods and services they desire. We're teaching young people they will be given everything, rather than showing they can earn their keep and provide value to others through hard work. This does not bode well for the future of our civilization. They were 19th-century English textile artisans who violently protested against the machinery introduced during the Industrial Revolution that made it possible to replace them with less-skilled, low-wage laborers, leaving them without work. The name evolved into the imaginary General Ludd or King Ludd who, like Robin Hood, was reputed to live in Sherwood Forest. Four years later, we have greater government involvement and, therefore, violations of libertarians' fundamental credos, in practically everything, especially health care, which was already the second most heavily regulated industry in the United States (second only to banking—and we saw how well that went). The regulations of your administration and those of administrations before you went awry. Every new law that violates libertarian credos creates unintended consequences that in turn create a perceived "need" for yet another law. Every interference in the marketplace—voluntary human interaction in civil society—creates more problems, which can only be "fixed" by yet more interfering. We keep seeing the same thing over and over again, but because the failures vary you think you can fix it "this" time. It sounds like insanity, except one must wonder whether those in power should be given this benefit of the doubt; it could simply be a lust for power over others. This entire scheme is uncivil. Consider the libertarian credos: nothing in them requires or depends on coercion. In fact, they depend on voluntary interaction among participants. This works in business and it works in our personal lives. In fact, "civil"ization is derived from "civil" society—one in which people interact voluntarily. No, it's not perfect; we make mistakes, which give us the opportunity to learn, to grow, to become all we can become, creating even bigger and better innovations for our society and our progeny to prosper. Government errs, and then demands more laws and more money to make up for those errors. Rather than lifting us up, government drags us down. Some libertarians believe this election provides us with a clear choice. I'm not convinced, but I doubt we can do any worse. I'm unconvinced, however, not for the reasons many others have—that you, Mr. Romney, won't give us other people's wallets. Rather, you've already shown that, like Mr. Obama and his big-government conservative predecessor Mr. Bush, you lack an understanding of basic economics—incentives and trade-offs. You passed Romney-care in Massachusetts, after which Mr. Obama's signature law is patterned; Massachusetts, with medical costs running the highest in the nation, is now setting up rationing boards. You seem to have the thinking of a technocrat, who thinks he knows better how to run things than we do as individuals in the marketplace. You have stated your support for a higher and, incredibly, even an inflation-adjusted minimum wage, which guarantees that those who can't yet produce enough to earn such a wage—the young and unskilled—won't become employed. I know your intent isn't racist, but this law is especially pernicious in that it prevents young black teenagers, who as a group suffer the highest unemployment rates of any, from finding employment and learning on the job. In fact, the idea of a government mandated minimum wage originated in an attempt to explicitly prevent blacks from competing against whites (as was true of many economically-controlling laws, from compulsory unionism to occupational licensing)—hence the assertion by black economist Walter Williams that it is among the most racist of all laws. You state you will "means-test" Social Security and Medicare—which will create yet more hidden and possibly exorbitant tax brackets, further discouraging people from becoming successful during their lives (which I elaborate on in the next article). You claim you have a "plan." This is the fundamental problem of government: it's arrogant to suggest you can plan our lives, Mr. Romney. Stop with your plans; please just let us be and work towards paring down your rules to simple ones, like "don't steal," "don't kill," and "keep your contractual promises." Worse, we have a fundamental problem with debt. For un-payable debt to be wound down, we must go through an economic wringer or suffer prolonged recessionary conditions. Japan is nearing its 23rd year of such conditions because its politicians have repeated stimulus "plan" after stimulus "plan"—and they have ended up with a gargantuan and, at slightly higher interest rates, unpayable debt load. Please learn something from history and the Depression of 1920-21, which we climbed out of quickly because the government did nothing. If you do nothing things will look really bad for a while, during which time we will need a great leader. This, you have the potential to become. When we come out of it we will see a whirlwind of economic activity unlike any we've seen in our lifetimes. My fear is you think "you know better" and that your base instinct is you too can micromanage our lives. Please resist that temptation, Mr. Romney. Here's what I will do in the unlikely event I am elected President: I will gradually eliminate everything government does outside its proper scope, which should be limited to protecting us from thugs. I will do this while doing our best to maintain the promises already made (Social Security, Medicare, Medicaid and the like), but maximize competition by putting decisions into the hands of recipients with the propitious use of vouchers (here's some money; now spend it as you see fit) and deductible savings (Social Security and Medicare could ultimately be privatized using this methodology). I will immediately privatize schooling with the use of vouchers and allow huge swaths of cost reduction via use of the Internet for education (which will, over the next decade or two, act as an immensely deflationary force and revolutionize education regardless). Except for the issue of air pollution, I will replace all environmental legislation with a simple rule: you will pay the costs of any pollution you create, with no corporate veil to protect you. This goes for the biggest polluter of all—government, which will not protect those individuals responsible. I'll privatize everything in sight—people take so much better care of what they own than what isn't (compare elephant populations in Zimbabwe where elephants can be owned vs. Kenya, where they can't). Since employees can be drug-tested, I will require all recipients of government aid to be drug-tested and deny such aid to any who fail until they test clean, after which they will be tested regularly. To create competition in deciding who is deserving of aid over the longer term, I will create a tax credit for all donations to qualified charitable organizations (as opposed to a deduction). Such credits will offset your taxes dollar for dollar, thus replacing government as welfare provider and trusting charitable organizations to eliminate unworthy recipients. I will suggest a five-year limit for all kinds of government-paid welfare, including food stamps and earned income tax credits; that should be enough time to get an education, but long enough to compensate for the fact that government schools have been underwhelming in their ability to educate. To make up for the fact that government has for decades encouraged employer-paid health insurance to the detriment of portability and guaranteed renewability, I will break my usual rules and require insurers to take all comers—but only for one year, after which everyone will be told, "You'd better have insurance, or after the year is over you're on your own." This will do much to encourage self-responsibility in regards to the purchase of health insurance. We might even offer tax credits to help pay for such insurance, so long as it's of the high-deductible variety to ensure patients have "skin in the game." I will require cost-benefit analyses for all existing laws and regulations and eliminate those for which the benefits are clearly not worth the cost. I will work to replace regulators with private ones, based on the Underwriters' Laboratories model (which privately regulates electrical components) and allow adults, with full disclosure, to opt out of regulations that purportedly protect them (I'd like to be able to purchase the anti-inflammatory drug Bextra, for example, even though there's a fraction of 1% chance it will kill me; aspirin can kill me, too). I will require that all regulations applying to individuals apply to governments; if a private person can be charged for the commission of a fraudulent act, government officials will be held culpable as well—including the commission of actuarial fraud, which will go far in solving the enormous underfunding of government pensions, which will gradually be converted to 401-k type plans. I will immediately eliminate all double-taxation, which includes the 35% of the 85% of Social Security benefits that have already been taxed once, the tax on dividends (which double-taxes corporate profits, which have already been taxed at the corporate level—and at the highest rates in the Western world) and the estate tax—a tax on a lifetime of a build-up of wealth, which has already been taxed at least once. I will gradually lower all tax rates as government programs are replaced by private ones, and eventually eliminate nearly all taxes since 90% of what government does will henceforth be provided by private charitable and profit-seeking entities. And in case you think this will put me out of business, it will. Don't worry; I'm perfectly capable of learning new skills. Of course, you can vote for me as a write-in candidate: Doug Thorburn for President. Then I'll still have a job. Good luck Mr. Obama and Mr. Romney. Social Security benefits were first subjected to federal income tax in 1984. Under the formula then set in place, the point at which non-Social Security income (including income from supposedly tax-free municipal bonds) plus half of Social Security benefits exceeds $25,000 for single and $32,000 for married taxpayers, up to half of Social Security benefits are added incrementally to Adjusted Gross Income (AGI). Back in 1984, when average benefits were a fraction of what they are today and $25,000 could purchase two new cars, very few recipients were affected. Because these thresholds have never been indexed for inflation and Social Security benefits have ballooned, increasing numbers of recipients are getting hit with exorbitant "real" but unadvertised tax rates. As benefits are phased in incrementally at the 50% rate for taxpayers in the nominal 15% bracket, the "real" marginal tax bracket for purposes of realizing additional income is (15% + one-half of 15% =) 22.5%. If a taxpayer is in the nominal 25% bracket during this phase-in, the real rate would be 37.5%. However, another phase-in rule now comes into play before this can occur—which makes it even worse. Beginning in 1994, Congress decreed that 35% of the remaining 50% of Social Security benefits should also be added incrementally to AGI, even though this "other" half of Social Security represents previously-taxed contributions. Taxing as much as 85% of Social Security benefits wasn't seen then as draconian, but only because few retirees were affected. After all, IRAs and 401-k's hadn't had a chance to grow to the size they are today; retirees' income was, in general, much less. However, this formula, too, has never been indexed for inflation. While both the 50% and 85% phase-ins have been stuck at the same non-inflation-adjusted threshold for nearly three and two decades respectively, retirement incomes, including Social Security benefits, have grown substantially. As a result, far larger numbers of Social Security recipients are taxed on increasingly larger portions of Social Security benefits. Once other income plus 85% of Social Security benefits hits $34,000 for single and $44,000 for joint filers and taxable income is subject to the 25% nominal tax bracket, the recipient pays (25% + 25% x .85 =) 46.25% on a "chunk" of their income, until 85% of Social Security benefits are taxed. While in practice this currently hits very few joint filers, this exorbitant tax bracket is common among survivors and other elderly single people. 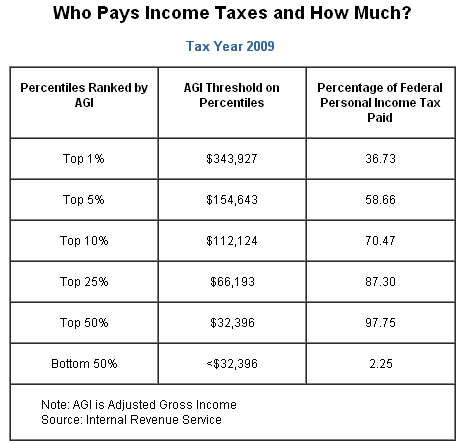 Due to other phase-outs of deductions as AGI increases, the real tax bracket can be even higher. The 7.5% of AGI threshold for deducting medical costs, the 2% of AGI threshold for deducting miscellaneous itemized deductions and the 5% phase-out of the zero bracket for dividends and long-term capital gains for those in the 15% nominal bracket once they hit the 25% nominal bracket can subject Social Security recipients to a confiscatory 30% add-on tax bracket on top of the nominal 25% bracket. You don't have to be a French retiree under Hollande with total income of $55,000 to be slammed with a 55% real marginal tax rate. In practice, while married couples are rarely hit with such high real marginal rates, they commonly pay 15% plus 85% of 15%, or 27.75%, over the expanse of the 85% phase-in. However, when one spouse dies, see above. In 2007, Congress made things worse for upper-middle income retirees. They added Medicare premium surcharges for Medicare recipients with modified AGIs over what is now $85,000 for single and $170,000 for married filers (paid via withholding from Social Security benefits two years later). Because these surcharges increase as income rises, they act like an add-on income tax, only much more surreptitious than most. Worse, they are like cliffs: once over a specific threshold, the taxpayer is hit with an additional surcharge. As a result, single Medicare recipients can be subjected to effective tax rates as high as 4,800% (and married couples as high as 9,600%). If income goes over the first threshold by just $1, a $480 per person surcharge is added to the Medicare premium two years later, unless a person falls under one of the limited exemptions, or dies—which is a lousy way to avoid even a 4,800% marginal tax rate. Commonly, even with careful planning, Medicare premium surcharges subject many Medicare recipients to effective tax rates of 30-40%. If public policy is to encourage working taxpayers to save, especially in 401-k's and IRAs, we need to let them know they will not be subject to confiscatory tax rates in retirement. Many of the proposals to "fix" the broken Social Security and Medicare systems involve "means testing" recipients. They are already being means-tested. Due to the taxation of Social Security benefits and Medicare premium surcharges this "testing" has led to much higher effective marginal income tax rates than most are aware of. If we are to continue with such "means testing," the phase-ins should be set at much higher levels, there should be no "cliff" provisions that instantly subject recipients to exorbitant tax rates, retirement income that has already been taxed once should never be taxed again and the phase-ins should be spread over much larger expanses of income. While the Buffet rule shouldn't be applied to the wealthy, who mostly invest their savings and are the engines of economic growth, perhaps an inverse form of the Buffet rule should be implemented: any phase-in of Social Security benefits and Medicare premium surcharges should never add more than 5% to the real tax rate for anyone, especially recipients in the 25% nominal bracket. The 30% rate would do much more to encourage investment, savings and capital formation if it were a maximum rate rather than, as often proves the case, a minimum one. Wealthy Californians: Where Will you Move When The Top State Income Tax Rate Increases by 30%? When California increases its top rate by 30% to 13.3%, which state will you move to? Note: many states don't tax Social Security benefits and certain types of pension income; others exclude pension income up to given levels. By the way, we have clients in about 25 other states and offer "moving" counseling. Dear Doug: Are Capital Gains Really Taxed at 15%? I'm thinking about hedging my bets and selling some stock now rather than next year, when tax rates may be much higher. Is it true my tax on a long-term capital gain will be only 15%? This is a much more complicated question than you most might imagine. 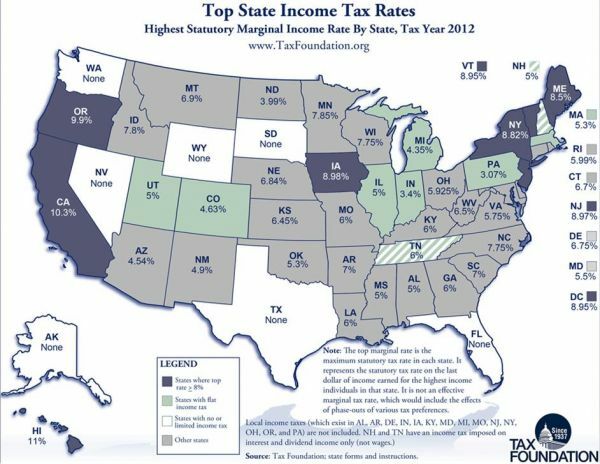 Your tax rate could be zero, 5%, 8.5%, 12.8%, 15%, 22.5% or 32%, or many possible rates in-between. How could this be when the statutory rate on long-term capital gains is 15%? 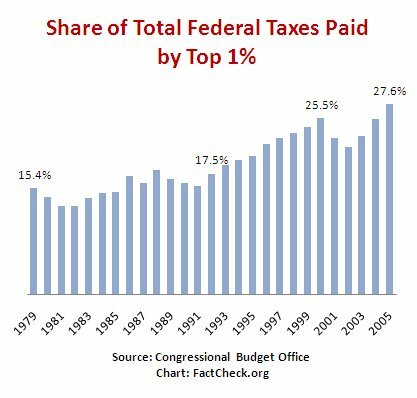 First, those in the 10% and 15% tax brackets get to pay zero on long-term gains. However, Social Security recipients may suffer an increase in the amount of Social Security benefits subjected to tax, which can result in phantom (but real) 5%, 8.5% and/or 12.8% tax hits up the level at which they enter the 25% nominal bracket. Second, those with large gains could be subjected to the Alternative Minimum Tax, which can result in an add-on 7.5% tax on top of the 15% nominal rate. However, there is a limit to this: I ran the numbers for a client with a prospective half million long-term profit on top of a substantial "regular" income and found that the federal tax rate on the first $50,000 of that gain would be 22.5% but the rate on everything over that would be taxed at 15%. It gets really weird and we need to run the numbers for every situation. Unfortunately, that doesn't count state income tax, which for that client is a solid 9.3% (and possibly higher depending on whether certain state propositions pass this year—in which case she may make a hasty move to Nevada). NOTE: A quintile is one fifth of the population. The breaks are (in 2011 dollars): 20% $16,812; 40% $33,542; 60% $59,486; 80% $103,465; 90% $163,173; 95% $210,998; 99% $532,613; 99.9% $2,178,886. Calculations assume that employees also pay the employer portion of payroll taxes in the form of reduced wages. *Individual income tax rates for the lowest and second lowest quintiles are negative and are netted against the payroll tax rate.